New York-based financial executive Janina Casey possesses more than 15 years of experience in equity research and sales. She holds a finance degree from St. John’s University and completed management training programs at Princeton and Harvard Universities. In her free time, Janina Casey enjoys golf. The process of getting out of a sand bunker in golf begins with selecting the right club. If golfers do not have a lot of green outside of the bunker, they should use a high-lofted wedge club. This type of club prevents the ball from rolling on the green too much, thus reducing the risk that it rolls off the green. However, a low-lofted wedge, such as a gap or sand wedge, is ideal when there is plenty of green for the ball to land on. Once golfers have the right club, they can focus on their set-up. For most bunkers, the ball should be played off the front foot to promote a high trajectory and better backspin. 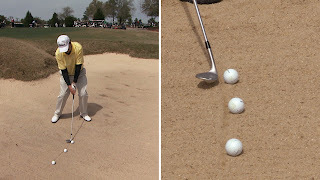 Meanwhile, the feet should be placed at roughly shoulder-width apart and be dug into the sand to increase golfers’ stability. This type of open stance may feel a bit awkward, but it helps golfers hit the ball upwards and more softly. Further, the clubface should be pointing almost directly up so that it has an easier time getting under the ball. Finally, golfers can try taking a swing. At the beginning of the swing, most of a golfer’s weight should be on their front foot. They should then use a half back swing to hit roughly a credit-card length behind the ball. Leaving this small distance gives the club a chance to get under and scoop the ball out of the bunker. Golfers should then employ a full follow-through the ends high up.